Tools are needed to put sustainable design theory into practice. To complement an earlier series of thematic resource guides organized around climate change, sustainable urban development, transportation, livable communities, and green infrastructure, this three-part "Sustainability Toolkit" will provide online toolkits, assessment tools, checklists, modeling software, and case studies designed to aid policy makers and design professionals roll out sustainable projects at the regional, urban, and local levels. The Sustainabilty Toolkit covers environmental, economic, and social models. Part one offered a range of environmental models. Part two covers economic models. Part three, which will be coming over the next few months, will explore the social components of sustainability, including community participation and public health models. Sustainability Toolkit: Economic Models focuses on economic sustainability, which involves the development of a healthy economy that supports and sustains people and the environment over the long-term. In a market-driven economy, cost is a deciding factor in determining whether a project moves forward. To be sustainable, projects must not only provide environmental and social benefits, but also offer economic value. Ecosytem service models can also be used to quantify the inherent economic value of services nature already provides for free. The toolkit is arranged from macro- to micro-scales, beginning with sustainable regional planning, and moving to sustainable cities & communities planning, sustainable neighborhood planning, and, then finally, site-specific tools related to sustainable landscapes and green buildings. Economic competitiveness is rooted in sustainable regional planning. By applying sustainable design principles to land-use, energy production, transportation, and infrastructure planning, regions can facilitate economic growth and investment. Sustainable regional planning enables regions to attract new businesses, raise real estate values, promote tourism, maintain biodiversity, and cut stormwater and transportation infrastructure costs. Furthermore, protecting ecosystem services, which provide nutrient cycling and crop pollination, clean drinking water, disease control, and climate regulation, benefits us economically. Financing regional projects is rarely a straightforward process. Regional planners must piece together funding from multiple sources, including federal, regional, state and local governments, leading foundations, and non-profits in order to create multi-layered roadmaps for sustainable regions. Sustainable planning strategies help cities attract and retain high-value industries and talent. 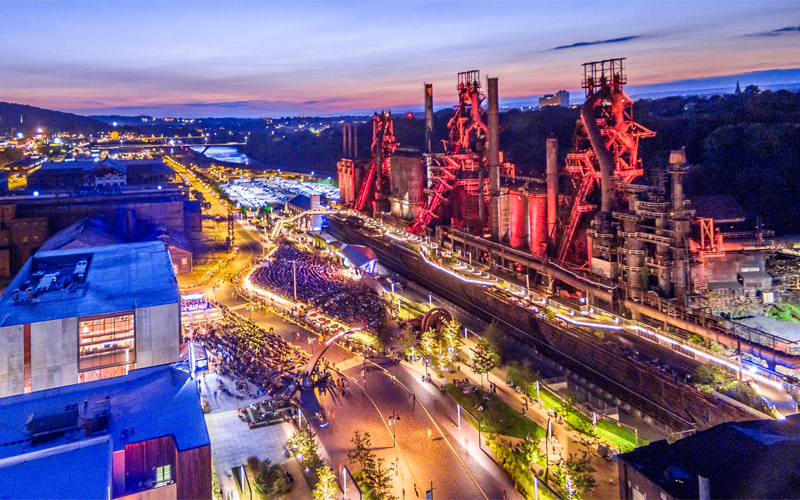 Businesses and people are attracted to places that offer multi-modal transportation, convenient park and recreation spaces, stunning streetscapes, and clean energy production. Investing in sustainable city and community planning help raise real estate values and increase tourism, adding to the economic vitality of the city. In addition, investment in parks and green infrastructure allows cities to take advantage of ecosystem services that lower long-run costs by reducing flood risk, stormwater management and treatment costs, and regulating temperature and climate. 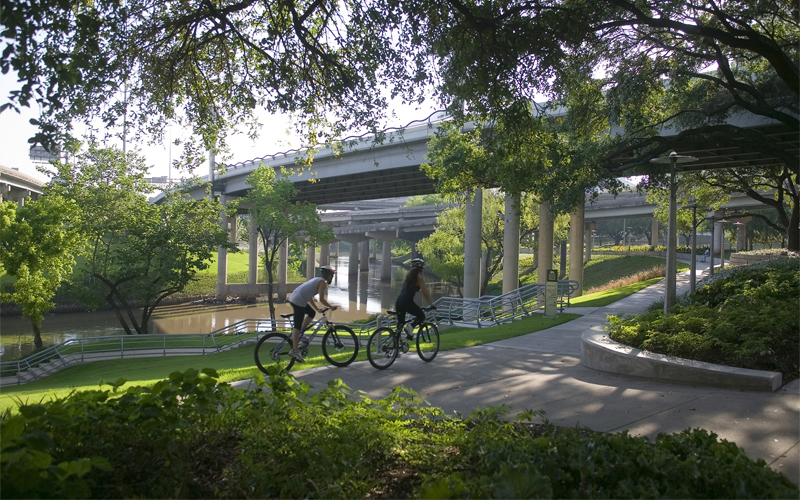 Sustainable urban and community development involves using policies, regulations, zoning, and tax-based incentives to guide the growth of multi-modal transportation networks, green infrastructure, open spaces, downtown revitalization and brownfield rehabilitation. For example, congestion pricing enables cities to move away from car-dependent transportation infrastructure. Cities can spur the expansion of urban tree canopies by mandating new property developments include a set number of trees. Lastly, creating grant programs so local non-profits and communities can participate in brownfield clean-up projects is key to increasing access to green space and bringing smart growth development to inner-city communities. Sustainable neighborhoods are diverse, compact, walkable, and connected, the antithesis of sprawl. Green spaces, complete streets, and mixed-use, mixed-income development, help unify a neighborhood as an economically sustainable unit. These neighborhoods create a virtuous cycle of economic development, attracting new businesses and residents, increasing local real-estate values, and reducing transportation costs. Sustainable neighborhood planning involves incorporating best practice models, like LEED-Neighborhood Development (ND) into neighborhood zoning and other regulatory frameworks. Local governments can require developers add adequate public green spaces and provide ecosystem services at the neighborhood level. Through local regulations, community facilities like schools can become agents of smart growth, which encourages higher levels of connectivity, instead of acting as enablers of sprawl. Using "form-based code" approaches, well-designed and functional streetscapes can attract people from surrounding areas to shop, eat, and visit cultural attractions. Neighborhood financing models include federal, state, and local funding mechanisms as well as grants, private partnerships and other creative methods like public fund raisers. Finding the best strategies involves researching available options given local conditions and project parameters. Sustainable landscape architecture practices reduce long-term economic costs associated with a site. Implementing permeable streets and driveways, bioswales, rain gardens and bioretention ponds and other green infrastructure systems through a Low Impact Development (LID) approach reduces the costs and amount of materials needed. The use of native plant species further reduces costs by lowering the need for artificial irrigation, chemical fertilizers, and frequent maintenance. Strategically-placed trees reduce heating and cooling costs required for buildings by providing shade during summer and wind breaks during winter. For urban neighborhoods, brownfield redevelopment offers the potential to transform contaminated industrial sites into economically productive landscapes. Turning brownfields into parks, for instance, can help cities and communities turn previously unproductive land into an asset that provides ecosystem services and attracts new businesses. The long-term economic value of a sustainable site can be calculated through a sustainable return on investment (SROI) approach. This approach is ideal for clients who seek to maximize the triple-bottom line (economic, environmental, and social) value of a site. This accounting model enables local policy makers and developers to monetize a sustainable site's ecosystem services -- the hidden benefits of sustainable sites, such as improved air quality, enhanced accessibility, limited stormwater runoff, and reduced greenhouse gas emissions. Green building design offers an array of economic advantages over traditional building design in terms of reduced operating costs and increased occupant health and productivity. The inclusion of green roofs, green walls, and on-site renewable energy sources increase a building’s energy efficiency and reduces the need to purchase non-renewable electricity from external providers. The use of recycled construction materials also provides significant economic advantages by reducing costs associated with transporting materials and waste disposal. Greener, more attractive working environments not only help increase productivity, but also offer added health benefits such as lower stress levels, which reduce sickness and absenteeism. Workers also tend to stay at their jobs longer, reducing the costs of recruiting and training new staff. A Sustainable Return on Investment (SROI) approach to assessing the value of green buildings allows local policy makers and developers to quantify the value of increased worker productivity, improved health and air quality, reduced carbon emissions, and limited landfill waste. Lastly, also check out a section on project financing resources. If you know of useful resources we've missed, please send your recommendations to info@asla.org. We appreciate your assistance in improving this guide.